​Wet sprinkler systems are the most common type of sprinkler system installed. A wet pipe system has water in the pipes in the ambient or normal condition and has heat responsive elements on all sprinklers. Thus, water is instantaneously discharged from a sprinkler when it actuates. A dry sprinkler system is intended to be used in areas where low temperatures could cause a wet pipe system to freeze. Dry pipe systems are pressurized with air in the ambient condition and experience an inherent delay in the discharge of water to allow the pressurized air in the system to escape. When a sprinkler actuates, air is released through the sprinkler, allowing water to flow into the piping system through the dry pipe valve. Pre-action and deluge systems require fire detectors (smoke, heat, etc.) to actuate. A deluge system uses open sprinklers or nozzles to allow flow water to be discharged when the deluge valve actuates. Deluge systems can be used for occupancies where the hazard is considered severe, such as with flammable liquid hazards where the fire could spread over a large floor area. Pre-action systems have closed heads and pipes filled with pressurized air that supervise a piping system, and can be considered for the protection of valuable assets or irreplaceable property. The detection system for a pre-action system can be designed to prevent water discharge in cases of a false alarm from the detection system, or in case of a sprinkler whose element has encountered mechanical damage. Actuation of a fire detector trips a deluge valve to admit water into the sprinkler piping to await the actuation of a sprinkler. Actuation of a fire detector or actuation of a heat-responsive element on a sprinkler trips a deluge valve to allow water into the sprinkler piping. Actuation of a fire detector and actuation of a heat-responsive element on a sprinkler trips a deluge valve to allow water into the sprinkler piping. A fire hydrant is an above-ground connection that provides access to a water supply for the purpose of fighting fires. The water supply may be pressurized, as in the case of hydrants connected to water mains buried in the street, or unpressurized, as in the case of hydrants connected to nearby ponds or cisterns. Every hydrant has one or more outlets to which a fire hose may be connected. If the water supply is pressurized, the hydrant will also have one or more valves to regulate the water flow. In order to provide sufficient water for firefighting, hydrants are sized to provide a minimum flowrate of about 250 gallons per minute (945 liters per minute), although most hydrants can provide much more. Liquimatter Engineering Solutions designs an integrated Hydrant System in compliance with the national and international standards. Our technical team considers capacity of the pumps, size and arrangement of pipes used for hydrant system, pressure at hydrant point against the available fire risk. Our designated hydrant system is an arrangement of piping, valves, hose connection and allied equipment installed in building and structure with connection located in such a manner that water can be discharge in stream of spray patterns through attached hose and nozzle for the purpose of not only extinguishing the fire but at the same time save the occupants and contents of area in with better response time. 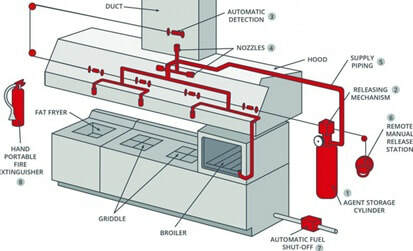 ​Fire Protection Gas Suppression System or simply called as Automatic Fire Suppression System (or Gas Suppression System), is unlike the conventional system that uses water; in Gas Based Fire Suppression System, water is never used and yet the fire is extinguished. Here the fire gets extinguished by gas, within a minute of activation and everything is automatic. Liquimatter Engineering Solutions have a wide variety of products in terms of Gas Suppression System that is suitable in every application. ​Fire pumps function either by an electric motor or a diesel engine, or, occasionally a steam turbine. If the local building code requires power independent of the local electric power grid, a pump using an electric motor may be utilized, when connected via a listed transfer switch, the installation of an emergency generator. The fire pump starts when the pressure in the fire sprinkler system drops below a threshold. The sprinkler system pressure drops significantly when one or more fire sprinklers are exposed to heat above their design temperature, and opens, releasing water. Alternately, other fire hoses reels or other firefighting connections are opened, causing a pressure drop in the firefighting main. Liquimatter Engineering Solutions have experience with variety of types and styles of fire pumps and can service, inspect and design a sprinkler system to work with many types of fire pumps. ​A fire needs three things to thrive: oxygen, heat, and fuel. Once the system detects a fire, the nozzles above the appliance will discharge wet chemicals. These wet chemicals are engineered to quickly put out fires by covering the flames and starving them of oxygen. As soon as the system trips, the gas line to the appliance will also be immediately cut off, depriving the fire of fuel. This two-pronged approach quickly puts out a kitchen fire without affecting other cooking stations. This means that you don’t lose all of the food being prepared in your kitchen, just the food that was burned in the fire. Since fires produce a lot of smoke, the hood automatically turns on to remove the smoke from your kitchen. Kitchen hood suppression systems respond automatically to fires, which minimizes loss. Liquimatter Engineering Solutions can provide you with products and solutions which are suitable for your application and in compliance with the National Standard and Fire Code of the Philippines.